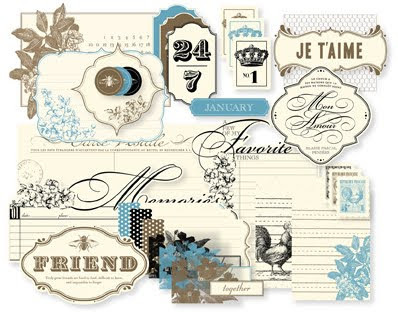 Today's offerings will give you beautiful vintage looks in easy-to-use digital formats! First up, Beau Chateau Embellishments. Use these elegant tags, notes, and accents for a quick way to add digital texture, dimension, or journaling to any project. The 41-pieces digital set coordinates with the traditional Beau Château Side Notes, with additional digital pieces for more colour options. Coordinating colours include Basic Black, Marina Mist, Soft Suede, and Very Vanilla. Next I bring you the Beau Chateau Designer Series Paper download. 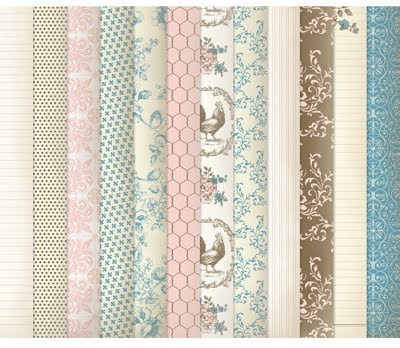 Give an elegant, antique look with these 12 Designer Series Paper patterns from the Beau Chateau line. Coordinating colours include Marina Mist, Pink Pirouette, Soft Suede, and Very Vanilla.